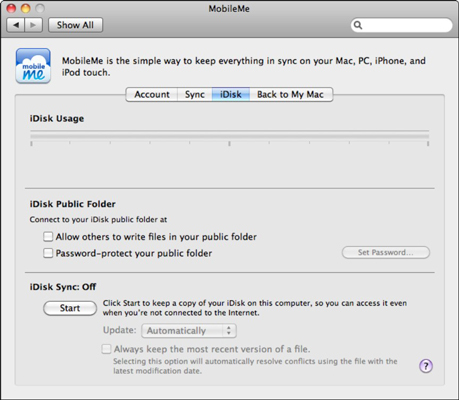 If you run your Mac on a network, you need to be able to control your network preferences. Snow Leopard lets you change settings for an Ethernet network, your modem, FireWire, and Airport on the Network group panel that you access via System Preferences. When you select Ethernet from the Services list, the Status pane shows your connection information. Because most networks have a DHCP server to provide automatic settings, you probably don’t have to change anything; Snow Leopard does a good job at making introductions automatic between your Mac and both a local network and the Internet. TCP/IP: These settings are provided either automatically (by using Dynamic Host Configuration Protocol [DHCP]) or manually (by using settings provided by your network administrator). DNS: The settings here specify the DNS servers and search domains used by your ISP. WINS: WINS is a name server required for computers running NetBIOS and likely only those computers running a version of Windows older than Windows 2000. 802.1X: This tab controls which wireless networking security protocols you may need to connect to a third-party wireless base station or access point. Click the Add Configuration button (with our friend the plus sign) to create a new wireless connection configuration, including your username, password, and the protocols that need to be used. Proxies: Network proxy servers are used as part of a firewall configuration to help keep your network secure. Entering the wrong settings often causes you to lose Internet functionality. Ethernet: From this pane, you can configure the settings for your Ethernet network interface card. You should not change these unless told to do so by a system administrator. Modem: Click the Modem pop-up menu and choose the brand and model of your modem. If Mac OS X detects an internal modem, it’s used by default. DNS: These settings are the same as those in the Ethernet network settings. WINS: Again, you’re likely to never need these WINS settings. Proxies: Some ISPs use proxy servers for their dial-up accounts to maintain security, but changing these settings willy-nilly is inviting disaster. Leave them disabled unless given specific instructions on what to set by your ISP. PPP: Your ISP provides you with the right values to enter here. Network Name: Snow Leopard handles wireless connections automatically in most cases. If the last wireless network you joined isn’t available or there are others to choose from, Snow Leopard displays a dialog asking you which available network you want to join. Turn AirPort Off: Wireless networking is a significant drain on a laptop battery! If you’re sure you’re not going to use your MacBook’s AirPort network, you can click this button to activate and deactivate your Mac’s network hardware. Turn off AirPort if you don’t need it, and your laptop will thank you. Show AirPort Status in Menu Bar: You can immediately see the relative signal strength of your connection, switch between available wireless networks, and turn off your AirPort hardware to conserve your battery power.